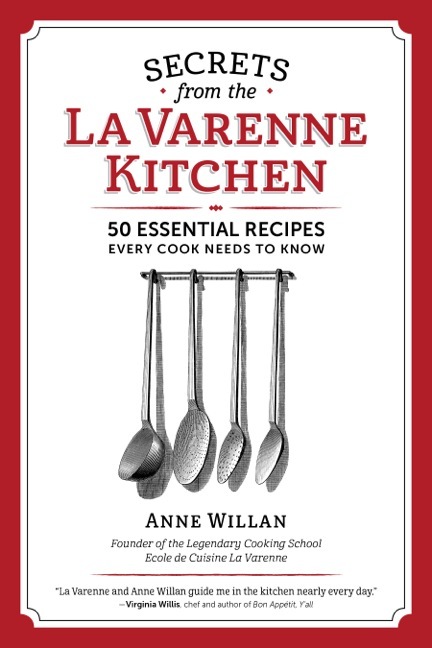 Join us for the very first talk on Anne Willan’s new book Secrets from the La Varenne Kitchen. Hear the story behind the classic recipes that make up many of today’s finished dishes. From hollandaise and béchamel to choux pastry and basic ice cream, every recipe has its roots. Anne will review and discuss her 50 fundamental recipes and their place in history. Stick around to sample a few! Anne Willan has had an extraordinary career in the culinary arts and is recognized as one of the world’s preeminent authorities on French cooking. She founded École de Cuisine La Varenne in Paris in 1975, and has had more than 50 years of experience as a teacher, cookbook author, culinary historian and food columnist. She has written more than 30 books, including La Varenne Pratique, French Regional Cooking and the 17-volume, photo-illustrated Look and Cook series, showcased in her 26-part PBS program. Anne’s books have been published in 24 countries and translated into 18 languages. In May of 2013, Anne was inducted into the James Beard Foundation’s Cookbook Hall of Fame and her last book, The Cookbook Library: Four Centuries of the Cooks, Writers, and Recipes that Made the Modern Cookbook was awarded the Jane Grigson prize for outstanding literary writing by the International Association of Culinary Professionals, as well as the prize for best book in the Food History Category.